Polyaluminum chloride, popularly known as PAC, is a spectrum of inorganic polymers. It has higher charge density than traditional coagulants. Polyaluminum chloride is beneficial than the traditional coagulants, as it gives better results at lower doses compared to alum or other iron salts. Polyaluminum chloride is available in liquid and powder forms. The powder form is generally preferred over the liquid form. The polyaluminum chloride market is expanding at prominent pace. Asia Pacific is anticipated to dominate the global polyaluminum chloride market during the forecast period, followed by Europe and North America. Clean and safe drinking water is essential for human life. There are numerous substances by which drinking water can get contaminated such as animal waste, disposed chemicals, and pesticides. Moreover, in several places, drinking water is not properly treated, which may pose risk to public health. In order to avoid this, governments across countries have implemented environmental and industrial norms by framing water regulatory bodies for examining drinking water and industrial wastewater. These bodies primarily focus on water treatment as a means of providing safe drinking water to public. Moreover, companies are taking initiatives for recycling of wastewater for reuse. Alum is a common coagulant used for water treatment. It is less expensive than other water treatment chemicals and is easy to use. Although polyaluminum chloride is more effective than alum, its price is twice or thrice the price of alum. Also, alum is a readily available coagulant and is a common water treatment chemical. Furthermore, water treatment technologies are expensive and they require a high level of technical knowhow. These factors are anticipated to hamper the demand for polyaluminum chloride during the forecast period. Freshwater reserves are becoming scarce owing to rise in the demand for water led by increasing population and growth of the industrial sector. In order to face the situation, alternative water resources are required. Wastewater treatment is a process employed to convert wastewater into reusable water. By applying this process, wastewater can be returned to the water cycle with minimum effects on the environment. Wastewater treatment comprises physical, chemical, and biological operations and processes to remove solids and organic matter from water. Polyaluminum chloride has the ability to coagulate effectively in water with low or high turbidity. It is widely used in municipal and industrial water treatment plants and also, in the separation of slurry in industrial processes. Thus, depleting freshwater resources and increasing impurities in wastewater have augmented the need for water treatment chemicals. This, in turn, has generated the demand for polyaluminum chloride. Polyaluminum chloride is available in two forms i.e. liquid and powder. Powder is the dominant form segment of the market and the trend is likely to continue during the forecast period. PAC in the powder form is costlier than that in the liquid form; however, due to ease in transportation and longer shelf-life of the powder form, it is preferred over the liquid form. Among applications, the potable water treatment segment held a considerable share of the polyaluminum chloride market in 2017. Depletion in freshwater resources and rise in awareness regarding water quality have propelled the demand for polyaluminum chloride. Asia Pacific accounted for a major share of the global polyaluminum chloride market in 2017 and is expected to continue its dominance between 2018 and 2026. Asia Pacific is the most populous region in the world. It is also a prominent industrial hub. Demand for water in the region has been continuously increasing, generating a need for water treatment for potable and industrial purposes. Implementation of stringent environmental and industrial norms related to water treatment is a key driver propelling the demand for polyaluminum chloride in Asia Pacific. The market in the region is expected to register a significant growth rate compared to other regions. The markets in Europe and North America are expected to experience moderate growth during the forecast period. The global polyaluminum chloride market is consolidated with a few prominent companies accounting for a major market share. These companies have well-established manufacturing facilities and distribution network across key regions. Major players operating in the global polyaluminum chloride market are Kemira Oyj, 3V Tech S.p.A., BASF SE, Gulbrandsen, Nippon Light Metal Company Ltd. (NLM), Geo Specialty Chemicals Inc., Feralco Group, USALCO, Gujarat Alkalies & Chemicals Ltd., Kanoria Chemicals & Industries Limited. Polyaluminum chloride is a versatile inorganic polymer manufactured in liquid and powder forms. The powder form of polyaluminum chloride is majorly used, as it can be easily transported. Asia Pacific dominated the global polyaluminum chloride market in 2017, in terms of volume and revenue, and is likely to continue its dominance during the forecast period. Increasing use of polyaluminum chloride for potable water treatment is likely to drive the demand for polyaluminum chloride in the next few years. Also, stringent government and industrial norms related to wastewater treatment is a major factor expected to propel the demand for polyaluminum chloride during the forecast period. This report analyzes and Forecast the market for polyaluminum chloride at the global and regional levels. The market has been forecast in terms of volume (in tons) and revenue (US$ Mn) for the period from 2018 to 2026, considering 2017 as the base year. 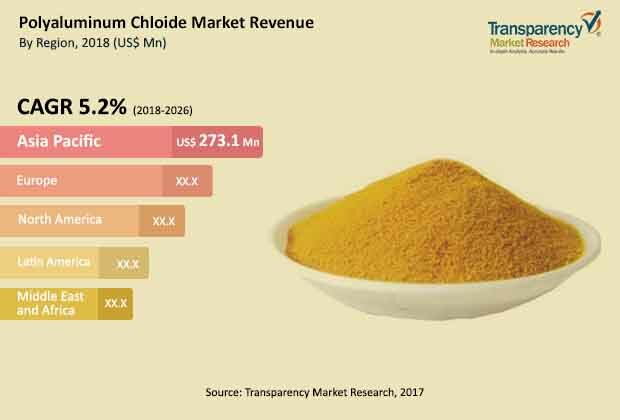 The study includes drivers and restraints for the global polyaluminum chloride market and also covers the impact of these factors on the demand for polyaluminum chloride during the forecast period. The report also highlights opportunities in the polyaluminum chloride market at the global and regional levels. The report includes detailed value chain analysis, providing a comprehensive view of the global polyaluminum chloride market. Porter’s Five Forces model for the polyaluminum chloride market has also been included to help understand the competition landscape of the market. The study encompasses market attractiveness analysis, wherein forms and application segments have been benchmarked based on their market size, growth rate, and general attractiveness. The study provides a decisive view of the global polyaluminum chloride market by segmenting it in terms of form and application. In terms of form, the polyaluminum chloride market can be classified into liquid and powder. Based on application, the market can be segmented into potable water treatment, industrial water treatment, pulp & paper sizing, decolorization in textile industry, and others. These segments have been analyzed based on present and future trends. Regional segmentation includes the current and forecast demand for polyaluminum chloride in North America, Europe, Asia Pacific, Latin America, and Middle East & Africa. The report provides the actual market size of the polyaluminum chloride market for 2017 and the estimated market size for 2018, with a forecast for the next eight years. Market numbers have been estimated based on form and application of polyaluminum chloride. Market volume and size have been provided for global, regional, and country-level markets. The report comprises profiles of major companies operating in the global polyaluminum chloride market such as Kemira Oyj, Geo Specialty Chemicals Inc., Feralco Group, USALCO, Gujarat Alkalies & Chemicals Ltd., Kanoria Chemicals & Industries Limited, 3V Tech S.p.A., BASF SE, Gulbrandsen, Geo Specialty Chemicals Inc., Nippon Light Metal Company Ltd. (NLM), Lvyuan Chem, and Grasim Industries Ltd. Market players have been profiled in terms of attributes such as company overview, financial overview, business strategies, and recent developments.